First thing’s first I’m the realest. Christmas trees are more than just a green pole on which you can stick some decorations. Why ruin your Christmas with fake-ness? There is something endearing about having your own REAL Christmas tree. Something that you have to keep alive. Plus, let’s face it: You can’t beat the smell of a fresh Christmas tree. Money ain’t a thing. The environment is. 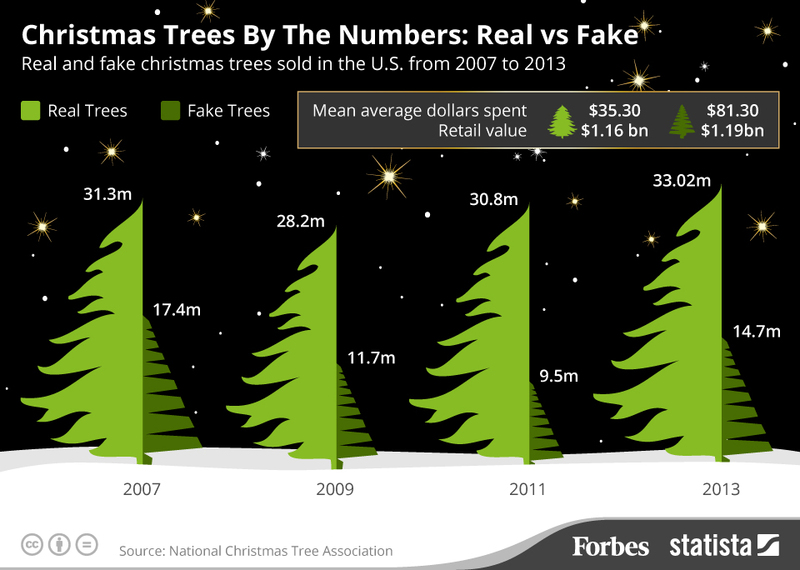 A fake tree come will come cheap, reusable, and maybe even pre-decorated. Though the durability and convenience of fake Christmas trees may make them more appealing, a life-cycle analysis conducted in Canada found that you’d need to use your fake tree for 20 years for it to be considered more environmentally friendly than your yearly evergreen. Few Christmas trees come from forests anymore. Virtually all of them are grown on plantations, and so buying real trees help support small, local farmers. At the end of the holiday season, the trees can be mulched up and used to feed plants, or for some other environmentally friendly purpose. All that budget decorating comes at a cost to the environment. Fake trees are made from the plastic polyvinyl chloride (PVC), and the toxic chemical dioxin is released during PVC production. (By the way, in the event of a fire, the tree will burn and emit toxins.) PCV contains hormone-disrupting plastic softeners called phthalates, and many fake trees have been found to be contaminated with lead. In fact, many of them come with a warning label advising you to wash your hands after handling them to prevent ingestion of the brain-damaging metal. Does that sound like something you want in your living room? In addition to all this, the plastic tree can’t be recycled, should you decide to ditch it for a newer model. So it’s going to wind up in a landfill and stay there forever, barring some intervention from St. Nick. So, this holiday season, be a good Lisgarite and purchase a REAL christmas tree. They’re more pleasant, and you and your family will enjoy it. And hey, if you’re supporting the economy and saving the planet while you’re doing it; that’s pretty cool too.